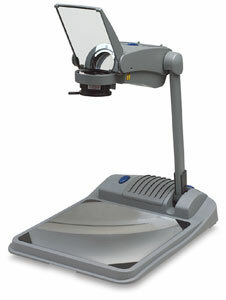 Invaluable for teaching lessons or giving lectures, this lightweight, ultra-portable overhead projector is handy for teachers or anyone presenting material on the go. Projecting more than 2,000 lumens of light, it will project most transparencies. The three-element vari-focal lens ensures sharper focus and picture clarity. It is fan-cooled. The unit fits into its own protective hard-shell case with a molded handle and internal cord storage. It weighs 8 lbs (3.6 kg). ® Apollo is a registered trademark.